Author Written by Ibn e Rasheed and last updated on Posted on August 16, 2017 . 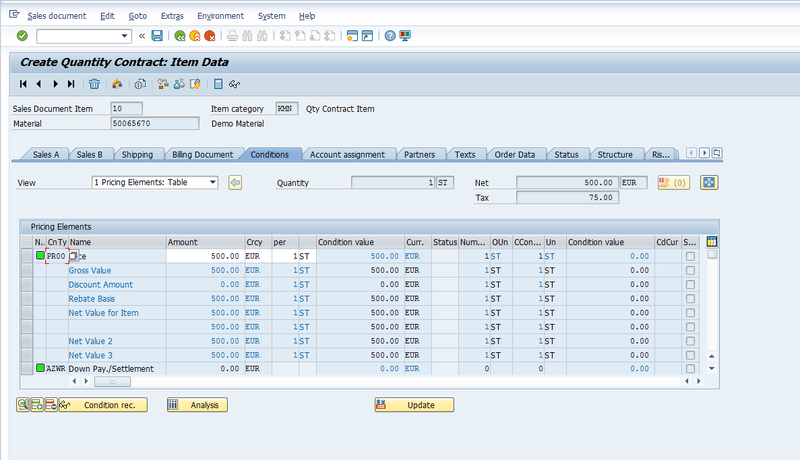 In this SAP SD tutorial, we will talk about contracts in SAP Sales and Distribution. 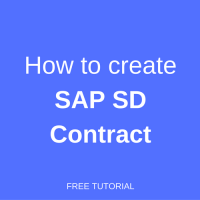 You will learn what SAP SD contract documents are used for and how to create them. We will provide screenshots and guidance that are relevant for this process. There are two types of contracts – value and quantity. Contracts can cover both goods and services. Generally, no restrictions apply to the different contract forms. A contract is an outline agreement between you and your customer that is valid for a certain time period. The contract does not contain any schedule lines, delivery quantities, or delivery dates. 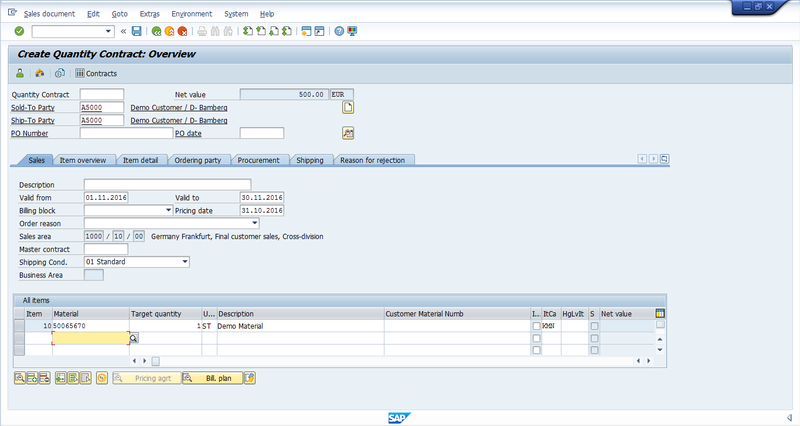 The same functions are available in contracts as in orders. You can also agree on special price agreements. The customer fulfills the contract with individual releases. 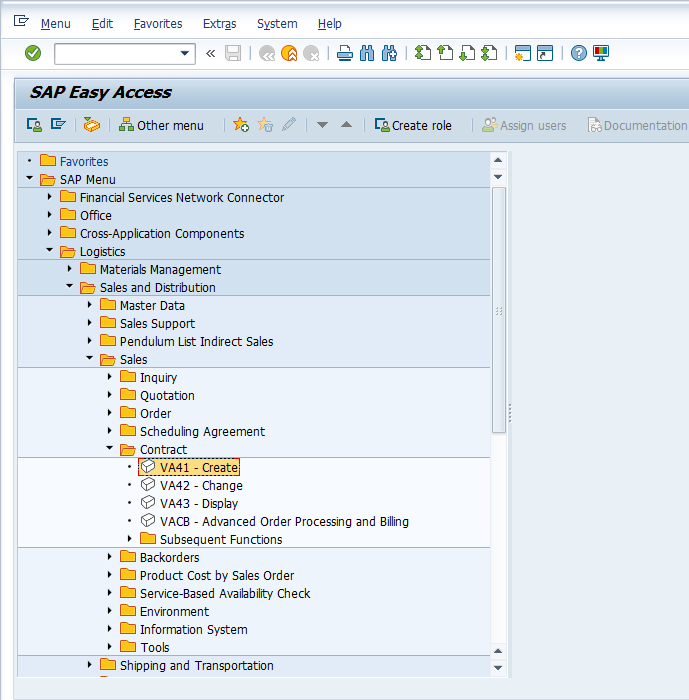 Schedule lines are created in the release order when it is placed. The release order is then processed like any standard order. Any special agreements regarding prices are copied from the contract. Release orders are created with reference to a contract. 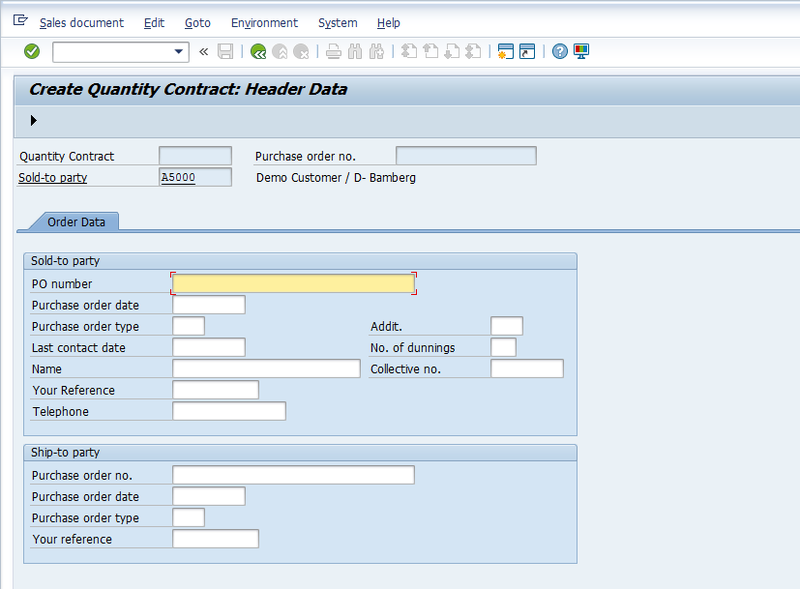 This generates a document flow record that allows you to update released quantities and values in the contract. 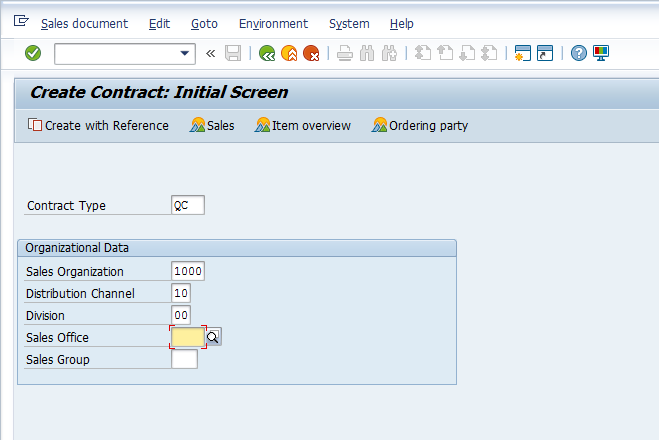 Once you have entered the contract creation initial screen, you have to select relevant contract type. Each contract type has its own functionality and viewing based on the configuration done at backend. Please note, any field having a ‘tick mark’ means its mandatory and it has to be populated else system would not allow you to proceed further. 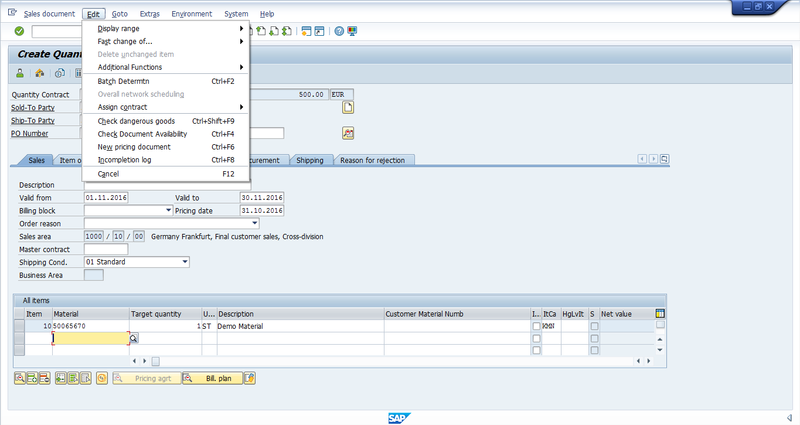 In order to opt for a required contract type, either press F4 on the respective field and it will show all LoVs (List of Values). 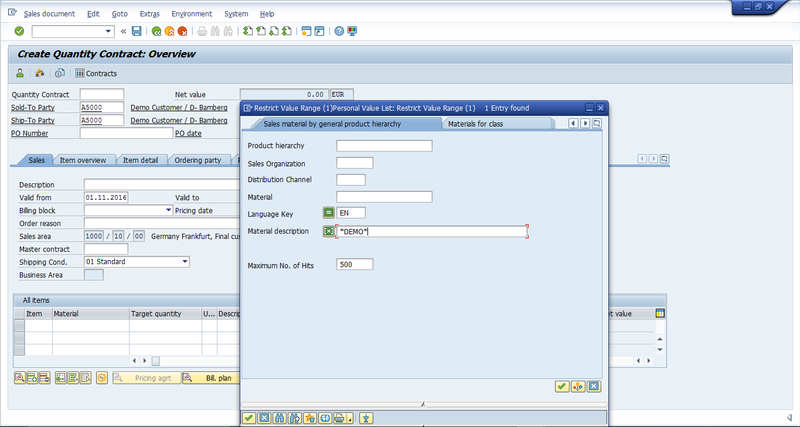 Populate Sales Area with your relevant Sales Organization, Distribution Channel and Division. 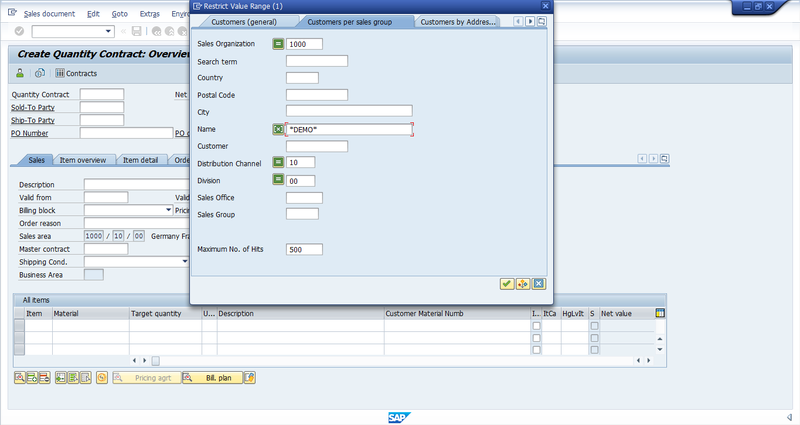 Hint: if you populate your relevant Sales Organization, Distribution Channel and Division first and then opt for the relevant contract type, only contract types relevant for the selected Sales Organization, Distribution Channel and Division will be displayed in LoVs. 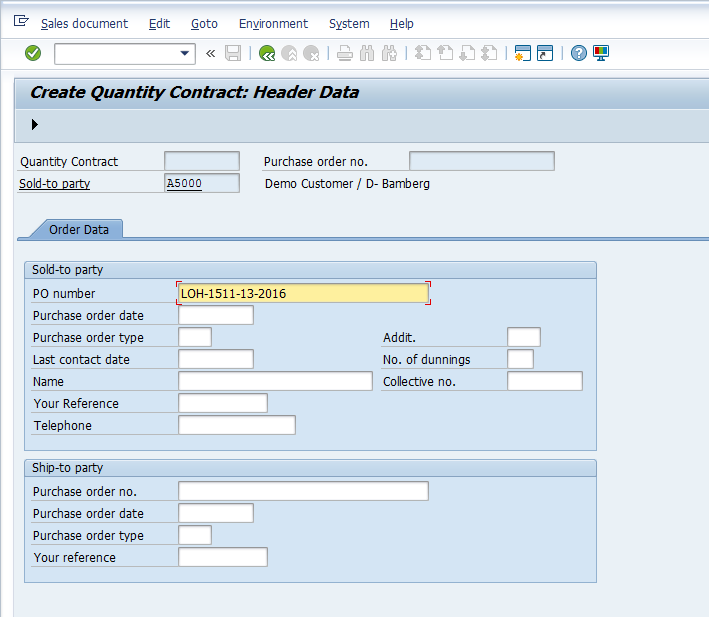 The following master data is involved when creating a contract. This master data fetches relevant information and populates the relevant fields accordingly. Partners associated with the customer, i.e. ship-to party, bill-to party, payer, etc. The process of communication with customer once the contract is created via printout of the quotation which is sent to customer by post, fax or email. This is the initial screen of contract once you have selected the relevant contract type and sales area (the combination of Sales Organization, Distribution Channel and Division is technically termed as Sales Area in SAP SD). 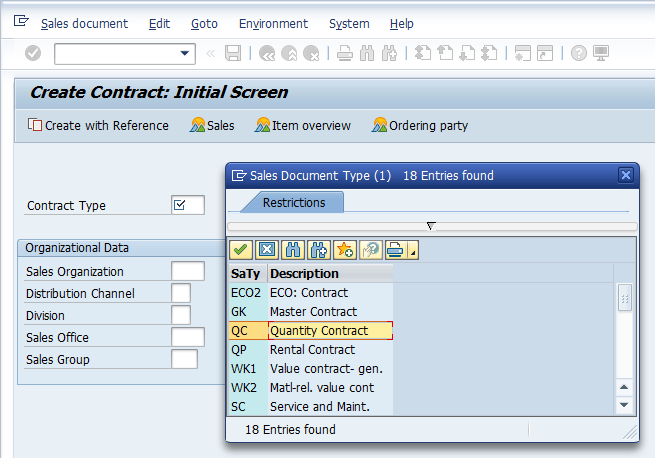 You can see Sold-To Party and Ship-To Party fields at the top left of the screen just below the contract field. One Sold-To Party can have multiple Ship-To Parties. 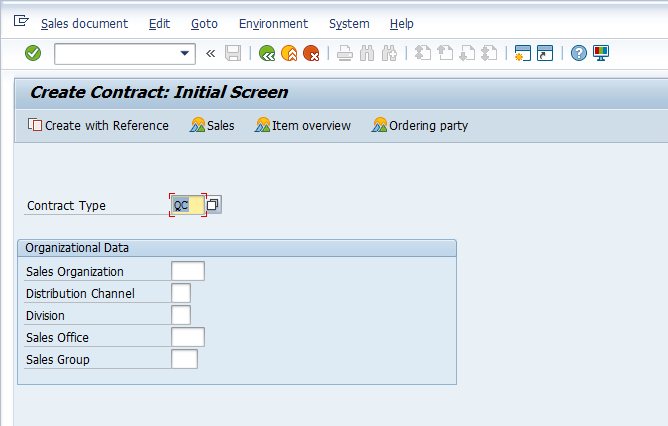 If there are many Ship-To parties associated with one Sold-To Party, a dialog box will pop up in the contract screen. You select the relevant Ship-To Party which the Sold-To Party has instructed you to ship the products at. 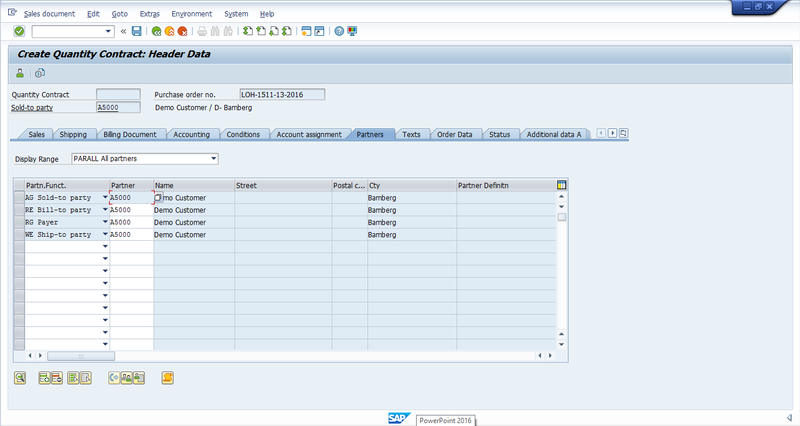 Press F4 or button on the Sold-To Party field to search for your relevant Sold-To Party. You can search by Search term maintained in the customer master or also by Name. To remain specific with your search, enter relevant Sales Organization so that only customer maintained in your Sales Organization will be displayed. 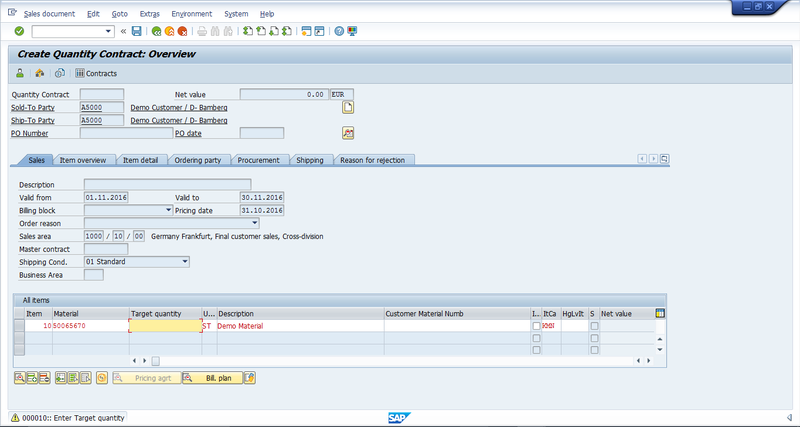 If you decide to find the customer with name, enter customer’s first name with * before and after the name. This is called a wild-card search. Hint: You can use asterisk to be more specific in your search and press Enter to get output of your search. Double click on the required Customer line in the contract to select that customer. 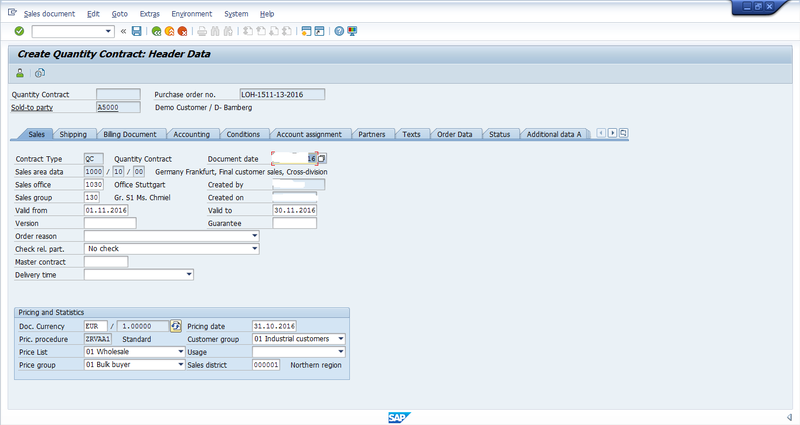 Press Enter once you have selected the Sold-To Party, so that the SAP system can accept the customer and proceed with the contract creation. Since this customer has two Ship-To Parties, a dialog box is popped up to select the relevant one which your customer, Sold-To, has instructed. Double click on the required one and same will be selected. Use F4 to search for the material the same way we did for customer and repeat the same process for entering multiple line items (if required). Double click on the desired material to select. 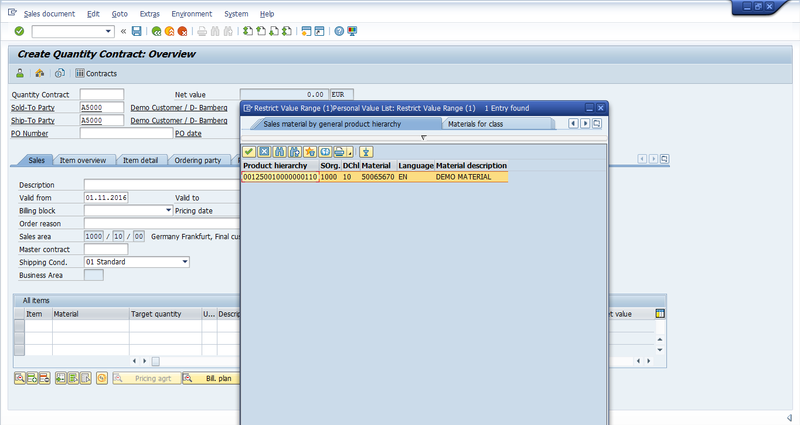 Go to Edit > Incompletion Log or Ctrl+F8 to see if the contract Created is Complete. 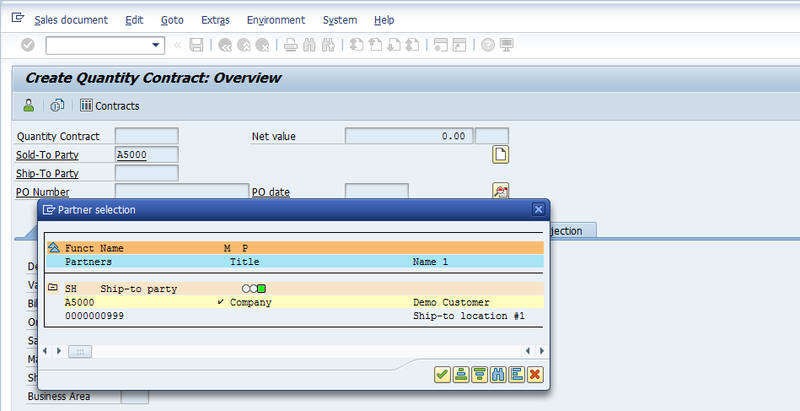 If there is anything or fields which needs to be populated, the system will prompt and new window will be displayed. Press or F2 to complete the missing data. Enter the PO Number. PO stands for Purchase Order and it is a number of customer’s purchase order. 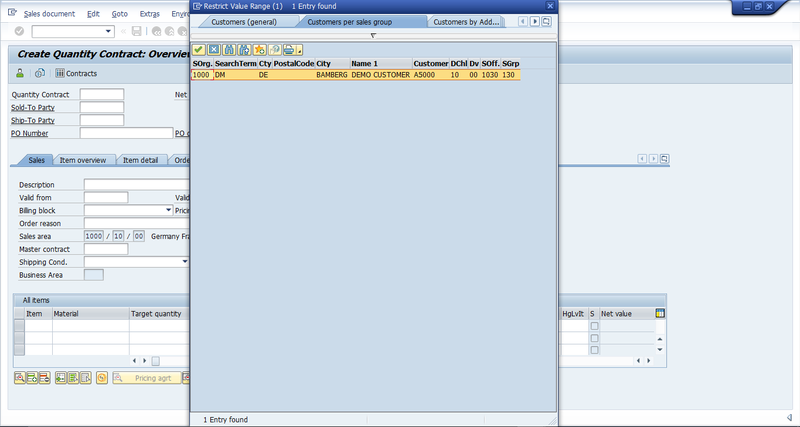 Press or F5 to populate the next data, if any. 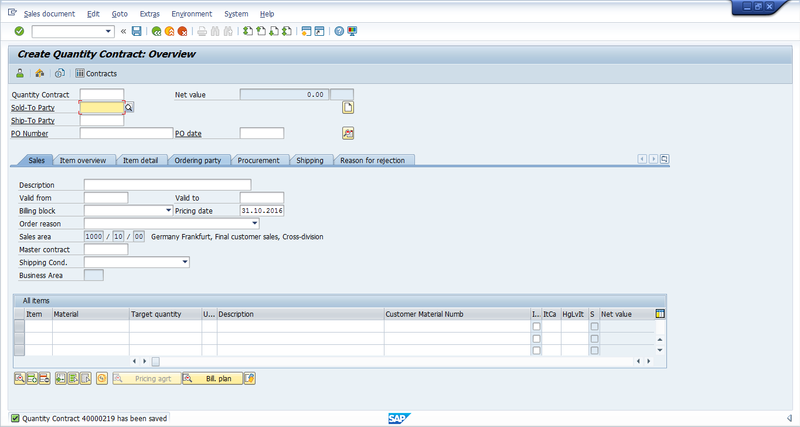 Once all the required data is populated, the system shall take you to the main screen of the contract. If the document is complete, the system will prompt the relevant message accordingly. .
Press button to view header details in the contract. Press to know the current status of the contract. Press to go back to the main contract screen. If you want to see the pricing of the individual material, select that line item and press this conditions button . Here, you can see the pricing of the selected product. Press to view material’s details. 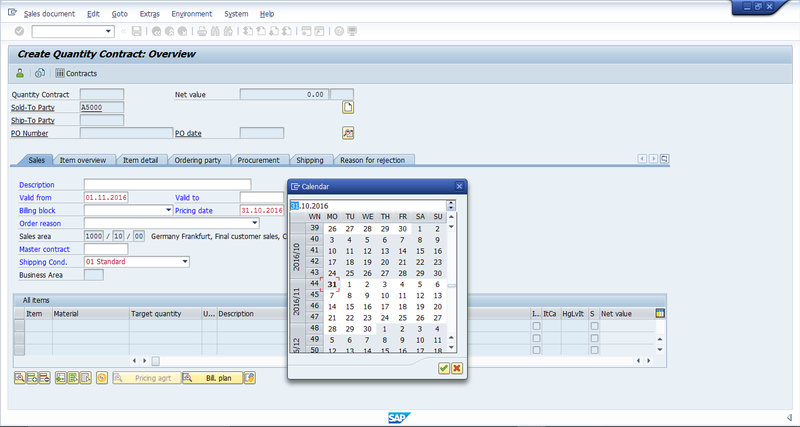 Once you have created the contract and satisfied with the information populated, press or CTRL+S to save the contract. I like the clear screen captures with instructions. Thanks for reading the tutorial and noticing this contradiction! We’ve updated the tutorial and removed the line about delivery dates.